Outlook (.ost) Finder is a comprehensive solution designed to search for OST files stored on the machines under same network domain. MS Outlook and Exchange Server installation is not necessary in order to run the software. Search and locates OST files stored on machines under same network. Scan, list and preview the OST files according to the name of the machine. Credentials of network domain required for searching OST across machines. 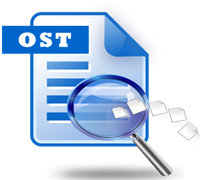 Provision to search for OST files across selective drives or all the drives. Once found the OST files can be copied and saved at a different location. MS Outlook installation is not required for searching OST files in machines. Exchange Server environment is not necessary for running the tool. The demo version of Outlook (.ost) Finder is available free of cost and can be downloaded to view the OST files stored in all the machines under a network. What Is The Need Of Outlook (.ost) Finder? At times, the users require to access OST files stored across different machines that are located under the same network. When it comes to search several OST files from multiple machines, manual searching can turn out to be very tedious. In such situations, commercial tools like Outlook (.ost) Finder enable the users to search for OST files in an instant. Once the machines are connected in the network, the software will locate all the OST files residing in them. Why Is The Tool Globally Accepted? MS Outlook is one of the most popular email clients and hence the number of users using it is also very high. When it is used in large organizations in synchronization with Exchange Server, a large number of OST files can be created in different machines. When it comes to search for all the OST files, Outlook (.ost) Finder is the most reliable solution for doing so. The software searches and locates all the OST files stored in all the machines that come under the same network. Will the software locate the OST files without domain credentials? No, for locating all the OST files, the user needs to know the domain credentials of the network. Do I need MS Outlook to run this software? No, MS Outlook installation is not necessary to runt his software. Can I save all the located OST files on my machine? Yes, once the OST files are located, they can be saved locally on the user machine. “Searching and sorting several OST files stored in more than 20 machines was becoming a difficult task for me. However, all my troubles came to an end with Outlook (.ost) Finder. The software searched and located all the OST files within all the machines and enabled me to save them as well."